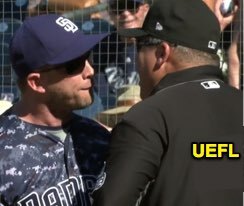 3B Umpire Fieldin Culbreth ejected Padres Manager Andy Green (unreviewable Fair/Foul call prior to a Replay Review decision that overturned HP Umpire Ryan Blakney's foul ball call to HBP; QOCY) in the top of the 9th inning of the Rangers-Padres game. With one out and none on, Rangers batter Robinson Chirinos attempted to check his swing on a 2-2 fastball from Padres pitcher Trey Wingenter, ruled a foul ball by HP Umpire Blakney. Green requested a review as to the issue of whether the ball, ruled foul, was actually fair (e.g., Green's contention was that the ball hit the bat and then bounded fair, while Blakney's original ruling contended that the ball hit the bat, then batter Chirinos' hand, and then bounded fair), after which the Replay Operations Center informed Culbreth (and Green) that this aspect of the play was not subject to review. At this time, Green was ejected for arguing the unreviewable Fair/Foul aspect of the play. Upon subsequent Replay Review as the result of a challenge by Rangers Manager Jeff Banister that the ball hit Chirinos' hand prior to striking the bat, Blakney's call was overturned to a hit-by-pitch, the call was correct. * At the time of the ejection, the Rangers were leading, 3-2. The Padres ultimately won the contest, 7-3. This is Fieldin Culbreth (25)'s third ejection of 2018. Fieldin Culbreth now has 4 points in the UEFL Standings (0 Prev + 2 MLB + 2 Correct Call = 4). Crew Chief Fieldin Culbreth now has 0 points in Crew Division (-1 Previous + 1 Correct Call = 0). *This call is correct pursuant to UEFL Rule 6-2-b-6-a regarding displayed reasoning: "Quality of Correctness is governed by the (in)correctness of the call made, not by the quality of reasoning given for such a call." The call in this case is the Replay Official's ruling of HBP, which is QOCY. *SD vs TEX requests for Replay Review, as pertains to the sequence of events relative to HP Umpire Blakney's original ruling of Pitch => Ball Hits Bat => Ball Hits Hand => Ball Lands Fair. SD Wanted to Review: Pitch => Ball Hits Bat => (THIS PART OF THE PLAY) Ball Hits Hand. TEX Wanted to Review: Pitch => (THIS PART OF THE PLAY) Ball Hits Bat => Ball Hits Hand. In other words, once the umpire rules the ball has hit the bat, no subsequent aspect of the play relative to whether the ball then hit the batter's person may be reviewed. This is similar to the standard "did the batter foul the ball off his foot?" question, which is not a reviewable play...but should it be? Related Post: Tmac's Teachable Moments - Let's Fix Replay (3/19/17). 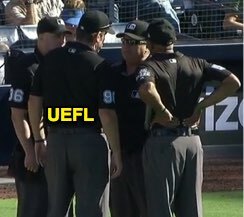 This is the 168th ejection report of the 2018 MLB regular season. This is the 69th Manager ejection of 2018. This is San Diego's 7th ejection of 2018, T-2nd in the NL West (SF 8; ARI, LAD, SD 7; COL 5). This is Andy Green's 4th ejection of 2018, 1st since June 29 (Angel Hernandez; QOC = Y [Balk]). This is Fieldin Culbreth's 3rd ejection of 2018, 1st since July 27 (Rick Renteria; QOC = N [Check Swing]).